If you'd like to take advantage of your off days and you understand why now, more than ever, it is important to have an organized and structured plan for your training, then reading this letter will become one of the best investments you can make in your soccer journey. Taking advantage of off day training (for any player) requires a shift in focus. The old way of training meant going to practice a couple times a week, kicking the ball around with your friends, hoping you get better. But going to practice only a few times a week and kicking the ball around is not going to get you to where you want to be as a soccer player. That’s why I’m thrilled you have an interest in the Total Control System. The system I provide helps you leverage your time at home and on your off days to become a completely different player. 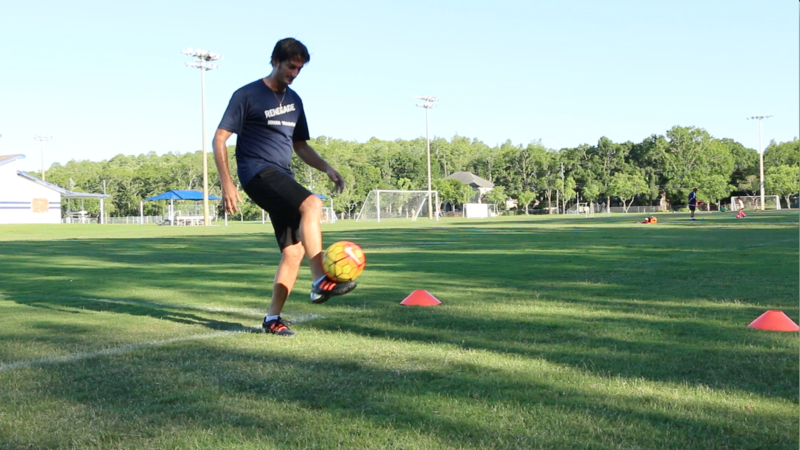 By simply following a 60-day program that combines the two areas every player needs to focus on, ball control and fitness, you maximize your results and eliminate any guess work. The new way to train emphasizes having a plan to follow on your off days that is tailored made for you. This makes your training easy to follow yet effective enough so you actually feel that you made some progress. As a strength and conditioning coach for over 20 years, working with some the most talented coaches from state to state, I had the opportunity to train with thousands of athletes. And during that time, I saw what worked and what didn’t work when it came to building and implementing an off day training routine. "He moved up 4 divisions in his age group this last year and now plays in the highest level for his age." "My favorite features is that the program that takes the guesswork out of training. "We are loving our first month of Renegade Soccer Training! AMAZING!! We tried 1 mile jog before starting RST and at 9 mins... "Daddy, I'm tired, can we walk?" Now with 12 Burst workouts and 18 days on Evolution of Touch, my son ran 2.5 miles straight at a 10 minute mile pace! Even finished it off with an 80 yd sprint. Coach JR's emails have become family bonding time in striving to work hard every day, not just for soccer. I am immensely grateful he has the words that I don't, to feed mental toughness to my 2 aspiring athletes, as well as helping me breathe confidence into them regularly. Renegades for life, legends when they hang'em up"
Here's a fact: The most successful players have made tremendous improvements in their game throughout their career by taking advantage of their off days. Why Did They Leverage Their Off Day Trainings? Because they realized that practice is where you learn about strategy, tactics, and team development…not individual development. So instead of spending their off days doing nothing, not focusing on their skill, they implement a system that gets them a large number of touches while also develops their body. In the long haul, it is a much more effective method of developing touch, confidence, and control. An off day program has become the cornerstone of all successful player’s development in order for them to stay competitive and play the beautiful game. How can YOU guarantee improvement month after month? The answer…follow a system that has a built-in progression. Every year, more and more players are signing up to participate in this great sport. While that is great for raising the level of play, it is going to make it harder to get play time since coaches and teams are going to have to manage larger rosters. On top of that, there is an ever-increasing number of video resources on sites like YouTube that provide players, parents, and coaches ideas on how to better their game. The problem is that without a system that has a progression built in, you end up doing video after video and not seeing or feeling any results. In the end, you’re at the same place you started with minimal or no improvement. What If You Don't Adapt? America is in a really interesting time where soccer is becoming more mainstream and accepted by the masses. Those that decide to continue the methods of the past or what I call the “old school” training model are going to continue to hope that their soccer goals will come to fruition. But you and I both know that “hope” is never something you want to bet on. Plus, with the old school training model, every training session begins to feel like something you “have” to do. Since most of these methods are just a collection of drills and exercises, over time, the player sees little value. And without some kind of progression, it becomes another drill lost in translation….it adds to the overwhelming feeling of information overload….stressful. ​You’re a player and you love to play soccer, it is your primary sport that you participate in. You spend time at the field or in your backyard outside of scheduled practice trying to improve your game. You sometimes find that you struggle getting the drills correct or when you have to use your weak foot, but you continue to train even though you might still have consistent problems while out on the pitch. You are a motivated teammate that your team can count on and you want to create a bigger impact. the Total Control System makes sense. It gives you the ability to leverage your off days to improve your game in a short amount of time. You get thousands of touches and you also improve your fitness. It takes care of the two biggest areas of potential in every player. Plus, you save yourself the headache of trying to structure and outline your entire training routines. Total Control Series is a great option because it is like have a personal coach one-on-one right in your own home or on the go. No more guessing what kind of fitness is right for your child. All you do is push play and watch your child as they follow along to the videos. Heck, you can even jump in there yourself! Total Control System breaks down ball control and fitness into different alternating segments so the players never feels bored or feel that the workouts are repetitive. All the while your child is getting thousands of touches and becoming a better athlete. The Total Control System is your solution to individual development for your players. It is a complete 60 day program that is laid out for your players to do on their off days. They can even do it before or after practice in order to fit another workout in. It takes over and ensures that they are working on improving their touch and fitness so you can focus on the team. So What Is The Total Control System? Total Control System is a 60 Day Off Day Training Program that combines ball control and fitness through 12 modules that you can do right in you own living room. It is YOUR off day trainer. I have been developing this program for over 2 years, working with one of the best technical coaches I know. With his expertise in ball control and my experience with speed and agility training, we have created a program that will make all the difference for you and your soccer career. When you incorporate this program into your training, you’ll have increased confidence, more security, and a whole lot less stress. Juggling is also an important part of learning how to control the ball with the right amount of power. In this collection, you get over 40 Uptake tutorials that will expand your ability to juggle and control the ball. This is the most “freestyle” we get, however, juggling is a great way to get more touches on the ball. How Is It Laid Out? You first start by taking a…. This is how you identify where you are when it comes to your ball control and fitness. This will give you a base that will set up for success with the program. Think of it as a fitness test. Once you know the results of the progress tracker, you are recommended to either select the Beginner Track or an Advanced Track. The beginner track is focused around ensuring that you have a solid foundation in the fundamentals. The program is set up so that you learn and excel very quickly. Core System – This is the Total Control System stand alone. This is a great place to start if you are new to the program. Core System + Ball Control – This is the core system with Evolution of Touch integrated into the calendar. Beginner players who would like additional training with ball control and movement with the ball should select this option. Core System + First Touch – The core system integrated with Wall Work Warrior integrated into the calendar. This is a great place to start if you are wanting to improve first touch and trapping ability. True Renegade – This is the core system with both Evolution of Touch and Wall Work Warrior built into the 60-day progression. We recommend it to only those players who really want to go above and beyond to excel at their game. Once an option is chosen, you are redirected to a page that has all the modules listed out for you along with a calendar that will act as your guide letting you know what modules to do on what day. Depending on the option that you choose, the modules already come integrated with the bonus, so all you have to do is push play. The Advanced Track is aimed at players who have a solid foundation of both ball control and fitness. This track has a more intense progression with more difficult drills. This allows players to excel in their position and excel with confidence. Core System + Ball Control – This is the core system with Evolution of Touch integrated into the calendar. On the Advanced Track, you will have more difficult Ball Control drills not seen on the Beginner Track. Core System + First Touch – The core system integrated with Wall Work Warrior. This is a great place to start if you are seriously wanting to up your first touch and trapping ability. On the Advanced Track, you will be emphasizing first touch into space and dribbling off of first touch. Rogue- This is the core system with both Evolution of Touch and Wall Work Warrior built into the 60 progression. We recommend it to only those players really wanting to go above and beyond to excel at their game. The Advanced Track should only be attempted by players who are extremely fit and can handle the change in pace. All of the program materials and instructions are provided in a members only website. You’ll be able to follow along and train at your own pace. While there is a system for you to follow, you do have lifetime access and the ability to access any module whenever you please. Either track, Beginner or Advanced has 4 paths you can choose. Each path has 12 videos that are laid out in a 60 day progression for you to follow. Once you are done with one path, you can go back and try a more challenging one. This means you have access to over 480 days worth of training! The training videos can be streamed through any wifi connected device such as your phone, tablet, PC, or Smart TV. You will also have downloadable MP3s of each module so you can workout with only your headphones. Who Is The Total Control System For? Our Athletes range from U9 soccer players who are just starting out to, to Division 1 College Athletes that are looking to improve their game even further. So if you are an aspiring soccer player, a parent, or coach, anyone who wants to have an effective off day training system that is reliable, simple, effective, and proven to guide you along the way, then the Total Control System is for you. Who Is The Total Control System Not For? This product is not for hobby players who only like to play on the weekends with their friends. It is not for players who aren’t committed to excelling at their game or that would rather be focusing on doing fancy tricks and spending precious training minutes just kicking the ball around. You know what I’m talking about right? This is the person who thinks that success is going to come without hard work. They magically think they are going to become a better player by not committing to themselves or to a plan. The program is focused on what actually matters. There are no fancy tricks or moves. Everything is intended to be used in actual game day situations with a strong focus on the basics. So if you’re someone that thinks they are too good, have exceptional control over the ball, and can take on any player at will, then this will not work for you. I’ve said it before, many of the drills and exercises are counter intuitive to what most people think they need to learn – and that’s partly why they work so well. You have to be open to what I’m sharing, otherwise it is going to be a frustrating experience. Trust the process. You are fully protected by our 100% Satisfaction-Guarantee. If you unsatisfied with this program for any reason, return it for a 100% refund within the 30 day period. "I personally guarantee you'll be amazed at the results you get with this program. I don't want you to risk anything. If you see no progress, I'll refund you your money, no questions asked. Click On The Add To Cart Button Below! Go ahead and click the button below and get one step closer to improving your ball control, coordination, and confidence so you can dominate on the field. The Total Control System is based off years of coaching and training athletes from all different kinds of backgrounds. It is a progressive system that focuses on developing ball control and fitness with guided instruction and coaching. There is truly nothing else like Total Control System out there. I hope you’ll join me during this launch of the Total Control System and take advantage of your off day training. I look forward to being your guide over the next 60 days as you develop your confidence on the ball and your level of fitness. At the moment, No. The videos can be streamed to any device that is connected to Wi-Fi or internet. Depending on your phone plan, you will be able to stream the videos to your mobile device and train wherever you are. Can I Only Do It For 30 Days? No. Once you purchase you have lifetime access. If you finish the 30-day routine that we have outlined, you are more than welcome to do it again or customize the routine for yourself. These videos will give you a great supplement to your ongoing training. What Age Is This For? U9 and up. The first videos in the program are meant for beginners and are aimed at developing a strong foundation. As the player progresses, so do the videos meaning that the videos increase with intensity and complexity to develop a player’s ball control and coordination. No. One you purchase, you’ll have lifetime access. This is a one-time payment. Do I Have to Follow The Schedule? No. While we outline a complete 30-day program for you to do. You can choose not to do and select which videos you would like to do on what days. You can make it work around your schedule. What If I Have Practice? If you have practice, you can use the Evolution of Touch as a supplement to get more touches or as a recovery workout. You can also schedule out the 30 routine we have outline for you across a schedule that works for you. It might take you longer than 30 days to complete the program, but you’ll a system that works for you. We're using content toggles in this section, which allows you to present many questions in a compact form. Your visitors can easily read more about the questions they themselves have and ignore the rest. "His coach noticed his improvement in first touch and ball control and made him captain." "We had tried different online soccer programs before. My son would get bored with them, so my biggest concern was that TCS was more of the "same old same old." We had received the burst video for free and it caught our eye. My son used it for a while and enjoyed it every time. My sons favorite feature of the Total Control System is the fast pace, the different levels and the fitness part. It challenges him to do better every time. Being able to do this indoors is a great benefit as well. His coach noticed his improvement in first touch and ball control and made him captain. The hard work paid off. Other parents can see the difference, too. Most importantly his confidence is up, he feels confident to play more creative in games, before he would only play creatively like that at practice. My son told his team buddies and friends about it. He mentioned the burst video to his coach. Truly, the best program we ever used. My son benefits from your blogs as well. I'm glad we found something that keeps his attention and keeps him challenged." "My only hesitation about recommending this system, is that I don't want to reveal our "secret weapon" to potential competitors!" At first, I wondered is whether of not this system would be useful and applicable for my players - who are on U10 and U8 teams. Also, time needed vs time available for my kids as well as the degree of supervision required by parents during program. Luckily I took advantage of a holiday sale that helped justify the cost of the complete program as not much more than a few private sessions; I rationalized that even if my son ONLY used the system for the two weeks at Christmas break when he would have NO club soccer, that in and of itself would be worth it; additional usage would be even better. So far, my favorite features is that my U10 has been able to independently follow the EOT beginner program, and never complained about doing it. I think it has helped his touch. We have predominantly done EOT. My son has a high degree of fitness so I wanted to focus more on touches than fitness. My only hesitation about recommending this system, is that I don't want to reveal our "secret weapon" to potential competitors! This years teammates (on a large un-tiered team) will be competing for the same spots on the tiered U11 teams at tryouts in May. Gotta keep any advantage we can! I think this is a great system. I have really enjoyed watching my sons confidence grow as his speed has grown. Now we need to focus on WWW for increasing his strength of passes and shots. As the small athletic kid, he has gotten by on his athleticism; he needs more power to marry up with the foot skills. A few videos on body positioning (using your body to shield the ball, shouldering competitors, or getting past opponents body positioning) would be very helpful! "This is the best system I have seenfor people that live the beautiful game and truly want to improve." "Before buying Total Control System, my biggest hesitation was the price. After analyzing similar products, I saw that TCS was a steal, and it looked to be the most effective way to build great ball control and confidence. Mostly I just really needed direction when I worked with the ball. The best feature to me is the wall work warrior. You get so many touches with both feet. Learn to turn into space and gain a lot of confidence making and trapping quick crisp passes. I love wall work warrior because it is the most game like situation. You can follow the passing sequences it gives you, and after you get comfortable with those to the point of mastery I find myself making my own sequences. The results definitely take around two weeks to become noticeable. It's mostly more confidence on the ball, and your body just feels smoother with the ball at your feet. This is the best system I have seen for people that live the beautiful game and truly want to improve. I'd recommend this to everyone who want some to improve. Think it would be great for younger kids because they could develop skills and confidence early on so when they get older they could just focus on the tactics of soccer. Thank you for tanking he system it has allowed me to improve on off days that I have and helped keep me in soccer mindset and shape during the off-season."